Like sand through fingers, twenty years have run out. October 13, 1987 feels like just a few weeks ago – a friend called with the news, I thought he was kidding.. refused to believe him..…got other phone calls and finally, the enormity of the event sunk in – no more Kishore Kumar. At that very moment, it seemed to be an impossible accident, given just how familiar, how intertwined he was, in our daily affairs. A song heard on a radio or one wafting in a bar or a poster of a Rajesh Khanna film or the spine-tingling anticipation of an upcoming RDB release – these were constant reminders of his presence. He was an elemental part of our own daily existence, one of the wicks in our shrine of Hindi film music that would glow forever. In my own case, and maybe in yours, these twenty years have been a paradox of sorts. For while age slowly marks its furrows on me and you, Kishore Kumar has grown younger. In the sense that except for his temporal presence, he is not only very much around in an unending stream of reissues of his songs, is woefully missed by today’s music directors who could not compose for him, but has been embraced by at least two more generations of Hindi film music listeners since 1987. This makes his a voice that has transcended six decades, about the same age as modern India, and like it, marches confidently into the future, on the world stage, very confident, very relevant and very much alive. Other Hindi film singers have commanded the same long, striking records of currency and affection. But with Kishore, it is different. Thousands of pages have been written on why he was a one of a kind. Suffice to say that in 2007 and likely in 2027, that deep humming or the fast opening or complete silliness or unmistakable yodel that begins a song, we know, belongs to one and only one singer – Kishore Kumar! On every anniversary of his, we in the Internet forums have made lists. And this one for me is no different. No one harnessed his voice better than the Burmans. That said, my next favorite music director for him is Laxmikant-Pyarelal. Whatever else may be said of them, there is no denying that their tunes, style and orchestration provided a wonderful change from all the rest of his composers. And a dazzling diversity within their own songs for him. From slick, all-western based to all-folk instruments, from loud extravaganzas to quiet softies, from soaring romantic expression to bitter regret, from slow-moving seductions to brazen oomph, from street-smart tapori to majestic, snow-bound heights – they did it in all these styles and more – for their songs for Kishore. So, on this 20th anniversary, these would be the 20 L-P Desert Island solo companions for me. Like trying to pick 20 of the best vines from a Sonoma field, an impossible restriction, given how hard and how bountifully Laxmi-Pyare worked for the perfection of a moment in time – when the great Kishore Kumar was in their studios. * A medley of the solos of Nazrana, Prem Shastra, Amir Garib, Jaaneman, Raja Jani, Wafa, Mastana, Aan Milo Sajna, Karz and Aashiq Hoon Baharon Ka. This entry was posted on Saturday, October 13th, 2007 at 8:05 am	and is filed under Specials. You can follow any responses to this entry through the RSS 2.0 feed. You can skip to the end and leave a response. Pinging is currently not allowed. part of our every day mood swings. Binu Nair../.. The Rafi Foundation /..Sargam Magazine / Mumbai. Kishore Kumar is gurudev,he still rules millions of hearts all over the world.Another genius like Kishore Kumar will never come.He has never died,mahaguru Kishore Kumar is IMMORTAL. I ALLWAYS LISTEN TO KISHORE KUMAR SONGS,TO ME ONLY ONE SINGER EXISTS IN THE UNIVERSE,AND THAT IS THE GREATEST KISHORE KUMAR. Also Kalyanji Anandji,Rajesh Roshan used Kishore Kumar most. before a “great concert” and I treasure those moments. dancing company for the song : Kaike Paan Banaras-wals. wild party along with the legendary Kishore Kumar. Yes Kishore Kumar can only live through his songs – forever. The world will never forget him..
You are indeed a lucky man Binu ji. Not everyone gets the chance to meet great legends like Kishoreda, Rafi sahab. MISS YOU KISHORE KUMAR SO MUCH,YOU ARE ALWAYS ALIVE THROUGH YOUR SONGS. in muscat and abu dhabi. After the show , I really became his fan. What a stage presence. What a presentation.. It was really great. But some of his slow and philosophical songs are out of this world. Kishore ji I am really lucky to have met him. who had passed away in 1980. The singer was Mohd.Rafi. My favorite duet of all time is “Achcha to Hum Chalte Hain” with Kishore & Lata. I wasn’t even born when they gave a live performance of this in 1983 in Wembley Arena – but I was amazed at brilliant personality Kishore Kumar showed while performing live. This live version was even better than the recorded version! Hard to believe a feat like that in times where singers heavily rely on lip syncing and artificial technology. In my opinion, he was the most entertaining live performer ever. So much personality! In another clip (maybe not from London) he talks to the crowd and pretends to lose his voice – hahahah! I grew up listening to Kishore and vividly remember when I was 4 or 5 always rewinding a tape of Dostana to listen to Salamat Rahe Dostana Hamara. We miss you Kishore da! It depresses me to know that there will never be another like you. At least we still have your songs to cherish! Binuji: it would be very appropriate if you shared anecdotes related specifically to Kishore Kumar. Either post it here (preferable) or hamaraforums. Thanks! and I appreciate the love of KK lovers for their guru. Companies are in crisis as current music doesn’t sell. much more and never can lose its glitter. Of course! My favorite singer is Mohammed Rafi by far although Kishore is one of my favorites too. Each singer makes UNIQUE contributions and that is why we try not to compare them. To compare sort of implies that we can do without the singer we judged not as good – and that is not true. Even if I think Kishore was a better singer than say, Pankaj Udas, I cannot take away from Pankaj Udas his famous “Chit Aiye Hai”. Of course, if Kishore Kumar sang that number – it’d be AMAZING too. But why? When one great rendition has been made – there’s no reason to have another great singer try to better it. I LIKE variety. Although my favorite singer is Rafi – I like the overall contributation that they ALL make. So yes, I totally agree with you! We must talk about all of them! What I meant was that you have specific inside info that isn’t easily found in books so you should share it! I’d love to hear ALL but obviously you’re busy and since this is a KK web page – the audience would be SURE to enjoy anecdotes specific to KK. So for your convenience I asked for only KK. I myself am a devout Rafian but in line with your opinion – I respect a variety of singers. I sort of regret to see you put so much effort with this Rafi Foundation. Lots of people love Rafi’s music. Common layman to business executives. How many would be willing to shell out required money – I don’t know. Hate to see you working hard on a project ALONE or without the support your or Rafi deserve. Look at Kishore Kumar’s house! Where’s Leena or his son? It’s sad to see a legend like KK get treated like that. Fortunately, we have the most valuable assets of these two great singers – they’re SONGS and what those songs mean to us. That will NEVER perish. 100 years from now – people will still love those songs and wonder if KK or MR were real, lol. Oh yes, one more piece of advice to you. When you realize you’re talking to a disrespectful 12 year old – don’t waste your time or honor that silly child with the privilege of conversing with you. Just discipline yourself and save your time and IGNORE such immaturity. Thanks. It’s funny you talk about Rajiv Vijayakur. I just sent him an email about Kishore vs Kishore – that article was a bit too biased in the beginning. Its amazing how time flies, 20yrs since Kishore’s passing. I have not yet heard his last song which I think was a duet with Asha (somebody please confirm). I tend to sing Kishore’s songs to myself, only because I can come nearer to imitating his voice. I have a considerable collection of his songs and I would like to get hold of Live Concert of him on DVD, does anyone know where I could purchase a DVD or VHS copy from? Not only Kishore was a great singer but a person of simplicity of life. He did not drink,smoke, go to parties or functions and at heart was a person who simply wanted to be one with nature that’s why he wanted to retire from the industry and go back to his native roots but unfortunetly for him he passed away before he could do this. THAN WHY YOU ALL KISHORE FANS DONT POST GREAT PICTURES OF KISHORE DA ON THIS SITE FOR WHAT ARE YOU WAITING FOR. I MYSELF TRIED TO POST THE PICTURES BY EMAILING THEM BUT UNFORTUNATELY THEY HAVE NOT YET BEEN POSTED ON THIS VERY SITE. SOMEONE PLZ TELL ME HOW CAN I POST PHOTOS OF THE LEGEND ON THIS SITE. Hi,I was 5 years old old when kishore da departed,I am a great fan of him ,I started liatening kishoreda in my teen n still I do.One day I will be no more on this earth but kishore da will remain as young as today for generations to come. As a huge kishore da fan my greatest regret of life is that he was not there when the great R.D BURMAN OR PANCHAM AS WE ALL KNOW COMPOSED THE MUSIC OF 1942 A LOVE STORY. R.D COMPOSED THE MUSIC KEEPING IN MIND KISHORE DA ONLY BUT SADLY THE GREAT MAN WAS NOT THERE WITH US TO SING THE SONGS AND IF HE WOULD HAVE SUNG THE SONGS THAN THE SONGS OF 1942 A LOVE STORY WOULD HAVE BEEN LANDMARKS JUST LIKE THOUSANDS OF HIS OTHER SONGS . AND THEY WOULD HAVE BEEN HARD TO IMAGINE THE HEIGHT OF CHEMISTRY THAT THE LEGENDS KISHORE DA AND R.D BURMAN SHARED WITH EACH OTHER JUST LIKE THEIR PREVIOUS TOPCLASS GEMS WITH EACH OTHER. I don’t see anything wrong with Rajiv Vijaykar’s article “Kishore v/s Kishore”. Infact he has recognized the Kishore-LP work very well, which unfortunately many Pancham Fans do not give much consideration. Kishore Kumar will always be alive through his songs. He is immortal. I have grown up listening to Kishoreda and his songs have truly been a source of inspiration to me. There can be no one like him. He is truly the best. Mere deewanepan ki bhi dawa nahi. Kishoreda, aap amar ho. Please if any one out there knows or have any Idia how can I get kishor da’s live concert on d.v.d I would really appreciate it . Once again help me . I am a greate fan and looking for live concerts on DVD. Please help!!! 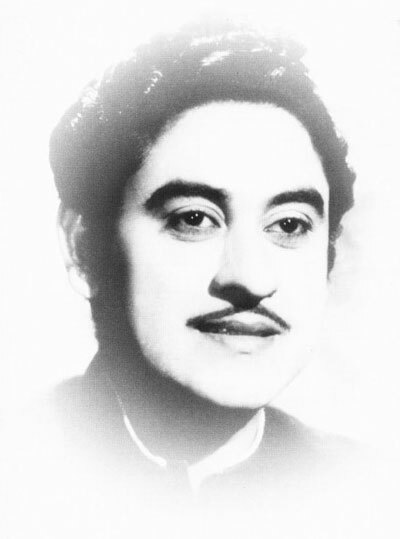 The people will always rember it, I am very big fan of kishor kumar. My wish is I should sing the kishor kumar’s songs. The eternal fool Binu Nair creeps in. Why does this creepy creatures (Rafi fans) appear in a site dedicated to Kishore Kumar, is a mystery. I believe these are the guys trying to defend Rafi, since we all know that Kishore Kumar was a ‘modern singer’ whereas Rafi was an ‘old timer’. All modern day folks (can I call myself modern? I am ’69 model) love Kishore Kumar over Rafi, which is a well known fact. Rafi might be a cool singer too (I like quite a few of his numbers), but he caters to the ‘older generation’. One can feel the modern-ness in Kishore Kumar’s voice. He never delved into classical numbers (he never had to, to dethrone Rafi). The crystalline pronounciation of the lyrics from Kishore da, is a treat for the ears. Moreso, since Rafi was ‘humble’. He could do anything to win the music director’s hearts.., but Kishore da carried a lot of ‘self respect’.., even then Kishore da won more ‘modern’ hearts?? its really baffling, something that drives Rafi fan’s nuts, leading them to encroach site dedicated to Kishore Kumar, and try spreading ‘Rafi’ virus. MOST GENUINE SUPERSTAR OF THE INDIAN CINEMA AND THAT IS RAJESH KHANNA NO OTHERS ACTOR COMPARE WITH RAJESH KHANNA SUCH A TRUE LEGEND. U r right.. LP and Kishore combination is great.remember all songs of Anurodh and at the top –mere dil ne tadap ke…and Jab dard nahin thaa..
and every song of Aakraman is a jewel.I miss kishore and I miss LP very much.No Rahman ,no Himesh can create that magic –Oh god–No ordinary human being can give this much melodious and highly popular music in more than 500 films..
when we talk about LP-KISHORE combination ,how one can forget Buniyaad. “pukaro,mujhe phir puikaro..” and Aansoo ban gaye phool—“badi bholi ho” ..and Man mandir—“jaadoogar tere naina”…and Roop tere mastaana–“dil ki baaten..” No one can break the records L-P made by giving non stop melody in various fresh styles and not only in one or two, but in hundreds of the films..
Now in the name of music directors we have imitators and thieves and dacoits and the animals running after money and ruining our own music . culture.May god give them Sadbuddhi..